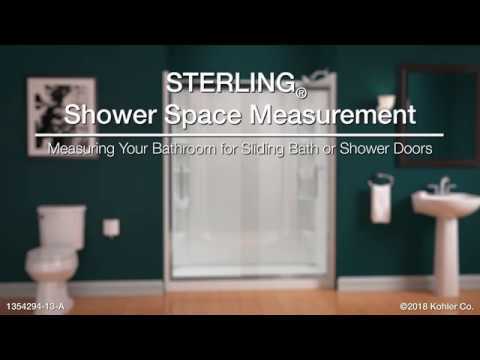 frameless sliding shower door 60" x 74-7/8"
Whiston shower doors bring quality design and elegance to your bath at an excellent value. Featuring a frameless design and tall 74-7/8-inch height, Whiston installs quickly with easy adjustability and no cutting required. Frameless, 1/4-inch-thick (6mm) clear tempered glass. Double rollers provide a smooth gliding action to give a quality feel for years to come. Magnetic seal keeps door firmly closed, providing excellent water containment. Knob handle keeps the design line simple and unobstructed. Low threshold (1-3/4-inch) for easy entry and exit. CleanCoat® glass treatment repels water for improved ease of cleaning. Detachable bottom rollers for ease of cleaning. Available in Silver (S) finish. Door can be installed to open right or left, depending on your preference.